“Ashino Park” in Goshogawara City, Aomori Prefecture is a nature-rich park with a wide waterfront and walkways. Ashino park is said to be a "place you want to visit once" among literary fans, as well-known writer Dazai Osamu, who was born and raised in this town, played well here when he was young. There is also a bridge in the park called "Dazai Bridge", which is considered as a place where Osamu Dazai walked to design the works. A park with an area of about 100 ha. 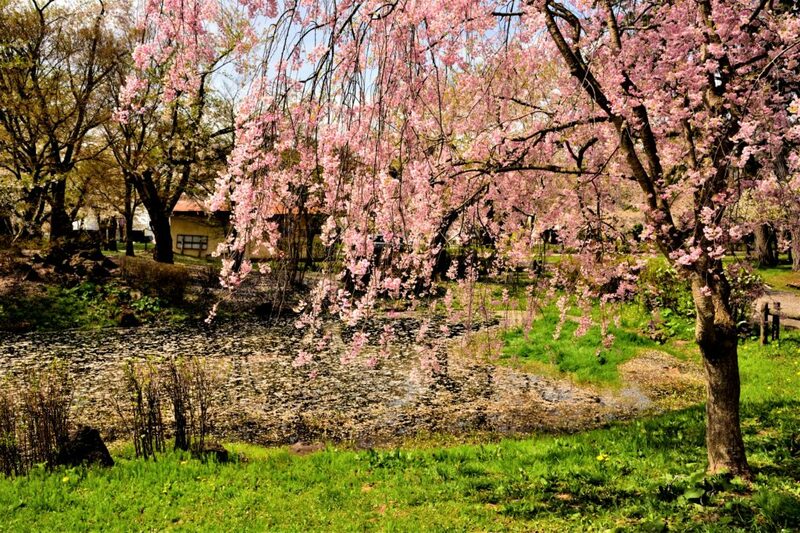 Deep in the snow, and after a long winter, there are about 1,500 cherry blossoms, including somei yoshino, satozakura and fern cherry blossoms, which are in the park around "Fujieda reservoir", and it is a beauty that overwhelms the viewer. "Ashino Park Satation" is an unmanned station except during the Sakura Festival. In fact, it is a place that also appeared in the novel "Tsugaru" of Dazai Osamu. The platform of the station surrounded by rich greenery has a taste that retains the image of the day, and you can feel the habit somewhere. Ashino Park, which I visited during the Golden Week, was in the midst of a cherry blossoms snowstorm. Many tourists visited the Tsugaru Railway train passing through the park to see the moment through the Sakura tunnel. People are stationed on the Asano Park platform, which is usually unmanned, during the cherry blossoming period. There are no circuit breakers at railroad crossings, and ropes will be put on the trains to prevent them from entering the area to prevent accidents. 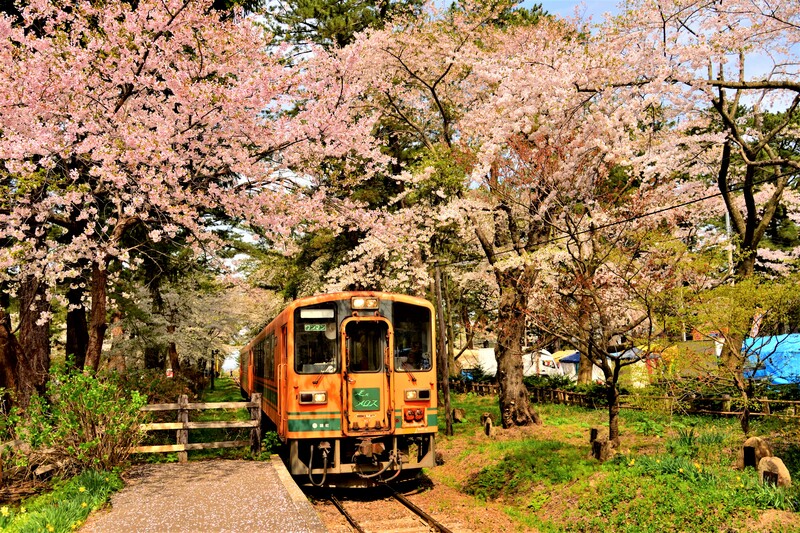 There is a cherry tunnel that blooms from the top of the track to cover from both sides, and the nostalgic atmosphere full of retro feel of the railway and cherry blossoms is a superb view. As the “Run Meros” approaches the station, tourists turn on the camera and smartphone from inside and outside the car all at once. A nostalgic vehicle and a cherry tunnel, together with the cherry blossom snowstorm, produce the best in Japan's spring. In the distance, many stalls line the eaves and colorfully decorate the Sakura Festival. During the Cherry Blossom Festival, stage shows and fireworks displays are held in the park, and lights up at night are also held. It may be good to enjoy the cherry blossoms slowly on the quiet lakeside while feeling the bustling and bustle of the festival in the distance. I enjoyed the idyllic spring scenery, taking in the warm sunshine of spring while taking in the petals of cherry blossoms falling like snow. It is approximately 40 minutes from Tohoku Expressway Namioka IC.